The idea for this book emerged after the Scottish Parliament election of 2007 which saw the emergence of a minority SNP government. The Constitutional Commission, which was founded in 2005 as an independent non-partisan organisation dedicated to “the advancement of education, citizenship and community development through a better understanding of constitutional structures, and processes”, was concerned about an independence referendum being held without prior thought being given to the constitution of an independent Scotland. The production of a model constitution would, in their opinion, enable a systematic discussion of all questions arising from the design of a constitution. The book contains three main parts. There is a draft constitution containing eleven main Articles, preceded by two explanatory chapters. The first of these, entitled “Introductory Notes”, deals with general issues which have to be decided prior to setting pen to paper in the drafting of a constitution. What are the basic assumptions, aims, values and principles of the political, legal and socio-economic regime? Unsurprisingly he comes out in favour of a liberal democracy, both constitutional and civic, which promotes well-being and cultivates excellence. In Bulmer’s view a good constitution is not merely a blind set of rules of procedure but should also provide an ethical basis that sets forth the shared goals and common standards of the community. This leads to more detailed discussion as to precisely what is meant by the term “constitution” and the adoption of Thomas Paine’s definition in “The Rights of Man” of 1791. Thus a constitution should establish rather than describe the rights and duties of the people, the powers, functions and relationships of the organs of government; entrenched but also containing a mechanism for its own amendment and a Supreme Court to guard against unconstitutional enactments. Parliamentary sovereignty is to be discarded in favour of popular sovereignty. Discussion of the majoritarian model of democracy (usually produced by first-past-the-post) versus the consensus model (usually produced by proportional representation) leads Bulmer to the conclusion that a form of PR is the electoral system best suited to an independent Scotland. The second main section, entitled “Explanatory Notes”, has to be read in conjunction with the text of the draft constitution which draws extensively from and updates that produced in 1977 for the SNP by the late Professor Neil MacCormick. The reasoning behind each of the Articles is extensively explained. The monarchy is to be preserved with the monarch’s powers exercised strictly in accordance with the advice and consent of the responsible constitutional authorities. Parliament is to be unicameral (a single legislative chamber) with a 4-year fixed-term and its members elected by the Mixed Member Proportional System (similar to the current AMS). There is to be a Prime Minister elected by parliament and a Council of Ministers appointed by the Prime Minister. The current Scottish courts are to continue, headed by a 7-member Supreme Court which can decide on the validity of laws. In recognition of the creeping centralisation which has occurred over a number of decades, there should to be a strengthened system of local government, consisting of Cities and Districts, based on the boundaries of the existing councils, to which legislative, administrative and fiscal powers based on the principle of subsidiarity are to be devolved. Properly resourced Community and Burgh Councils may be established by the District and City Councils to provide a more local second tier. Article IX is a list of Fundamental Rights and Freedoms which takes the European Convention on Human Rights as its starting point but builds on it in an attempt to make it more robust. There is a section on “Economic and Social Rights” which include the right to work, to fair and healthy conditions of work, to benefits and adequate pensions, to adequate healthcare, to a good education etc. Bulmer recognises the problems inherent in including socio-economic rights which are difficult for the courts to enforce and his constitution attempts to overcome these problems by not making these rights justiciable but by placing a moral and constitutional duty on Parliament to enact laws providing for these rights. His suggestion for amendment of the constitution is that a two-thirds majority of the Members of Parliament plus ratification by the people in a referendum should be required (Article XI). Bulmer believes that there should be a robust interim constitution which guarantees democratic principles and fundamental rights ready to be adopted by the Scottish Parliament as soon as independence is achieved. Then time can be devoted to the development of a more permanent one which might takes years before consensus is agreed. 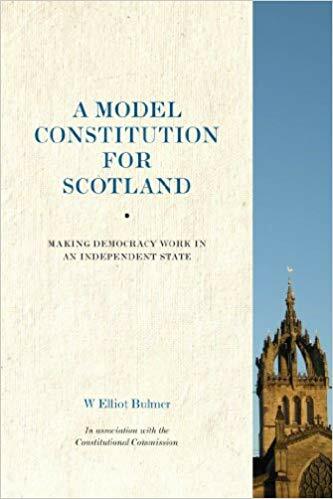 However, in the run-up to independence, voters will want much more detail about what an independent Scotland will be like and Bulmer’s constitution provides a good model for discussion.